Black*Eiffel: Have a great weekend! It was a crazy week for us with sickies around our house, a canceled birthday party, lots of work projects, and more. All that is behind now (well, almost) and I am really excited for the weekend because we are headed to San Francisco. *Some tasty pumpkin whoopie pies I made from this book but you can also find the recipe here. "Set the intention to make someone else happy -- and cause a ripple effect for positive change in our world." What are your plans for the Halloween/Autumn weekend? You can follow what we are up to in San Francisco on twitter if you want. Have a good one everyone! Sweet sweet butterfly wings... cherish those fun times! LOVE that quote!! Thank you! 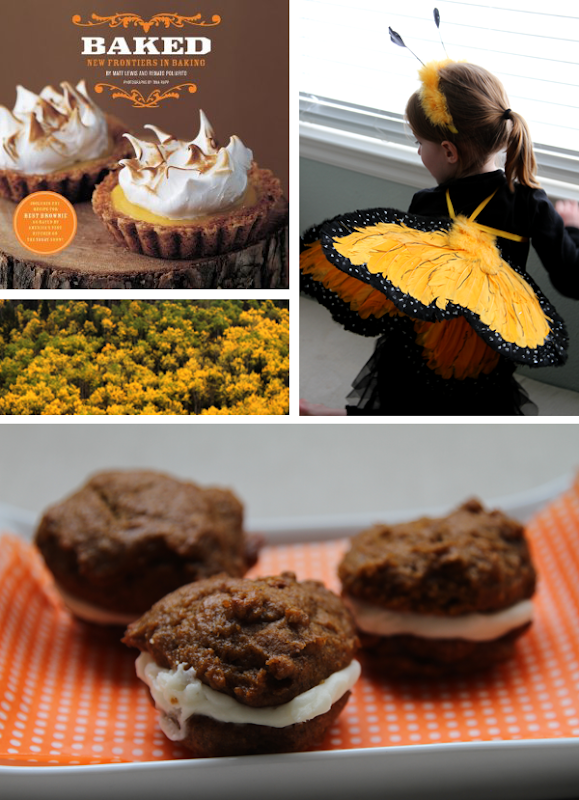 OMG, gorgeous post: love V's butterfly costume as well autumn's palette and mood. Have fun and enjoy your SF weekend full throttle! Ciao. Have a wonderful time in SF--I know I did when I was there two weeks ago! Adorable costume!! ...and those whoopie pies look divine! Yum! Have a great weekend. Ill be spending my weekend in ALABAMA!!! So green... wish I was in SF. Oh I love your blog - especially the wonderful, inspirational quote! And the gorgeous photos, of course. Such a huge fan of Baked. been meaning to get this book. Love the butterfly!